The FWV601BL is a single zone integrated 60x60 wine cooler with a large 40 bottle capacity. 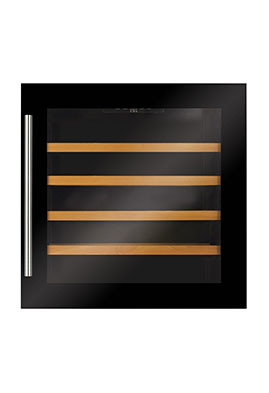 This design is the perfect size to sit alongside a single oven and fits into a standard single oven housing unit. It comes with an A energy rating and has a low noise level of 39dBA making this one of the quietest integrated wine coolers on the market. The FWV902 is an integrated, dual zone wine cooler. Capable of holding up to 55 bottles, with LED lighting and triple UV protected smoked glass door, it will ensure your wine is kept in optimal conditions. It comes complete with 5 wooden slide out shelves, an electronic temperature control with a memory function and alarm, and a display shelf to showcase your favourite wines. These integrated wine coolers are perfect for storing your wine collection. 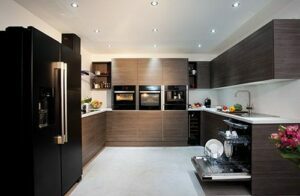 Controlling humidity, light, vibrations and temperature is done silently and effectively whilst the exterior in either black or brushed steel finishes off your kitchen perfectly. Our latest model, the FWV600BL is unique to the market with bespoke insulation that allows it to be installed next to an oven with no detrimental effect on performance. Storing wine in the fridge is simply a no-no for anyone serious about their collection. Fluctuations in temperature, light and strong food odours are all less than ideal environmental factors for your wine. The holy grail in wine storage is consistency, that is why we have created a collection of coolers that monitor UV, humidity, temperature and vibration closely to protect and preserve your bottles. 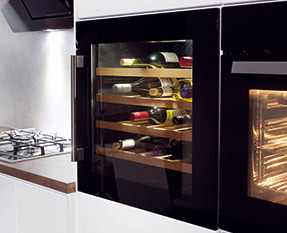 Integrating a wine cooler into your kitchen design is perfect for the streamlined look. Off the kitchen floor and opening just like a cupboard, the integrated wine coolers create functional cabinetry in your kitchen that frees up fridge space and stores wine in perfect conditions. We have created a range of sizes that will suit every home, design and storage requirement. Starting with the FWV451, which comes in a stylish black glass finish, that stores up to 24 Bordeaux sized bottles our integrated collection comes with a whole host of technical features. UV protective smoked glass, triple glassed doors, electronic temperature control, a compressor-driven anti vibration design, over temperature alarms and a humidifier have all been collated to produce a functional, stylish and highly effective wine storage solution. The 60cm FWV600BL is completely unique in design and a UK market first by CDA. The 60cm x 60cm style means that it lines up brilliantly with a built-in single oven, helping you to create the streamlined bank of appliances that looks so great in modern kitchen design. Storing up to 40 bottles, this appliance can house your red or white collection and the perfect environment created using the electronic controls. This model features specialist insulation that means it can be housed adjacent to an oven, with no detrimental effect on performance. The wine cooler will not have to work harder to cool your wine while the oven is on. This means that you can create the exact look you are going for without having to compromise on performance. The largest of our integrated models is the FWV901BL. Slightly taller in design this cooler would be perfect for a wall unit setting. Storing up to 55 bottles it can house your entire collection and also features 2 separate cooling zones to protect both red and white wines simultaneously. Whichever model you go for, we have created a user friendly wine cooler buying guide to help you choose the right model for you kitchen. Once installed we have tips, tricks and advice on how to store your wine collection perfectly, keep your cooler in great condition and even serve each grape and style of wine at the perfect temperature. For questions and how-to guides on any appliance in the CDA range, visit our frequently asked questions section for the most commonly asked questions on cookers, hobs, coolers and laundry appliances.